The early morning sun rises over the ranch, casting a soft glow in the sky as the first skiers head out for early morning runs on our freshly groomed 15 km of Nordic trails. They probably don’t give much thought to what goes into making the trail surface that perfect corduroy look and smooth surface. Even if they did they probably didn’t realize it started months ago by our team of trail experts and ski fanatics. The winter trail work that Deschu and her husband, Aaron, perform begins in the summer when they’re busy guiding our Green Season guests on horse rides. In the summer, the ski trails double as the route for horseback riders to explore our beautiful country. The Deschus pay attention during those rides for downed tree limbs and other debris that needs to be cleared. They’ll come back after the rides to clear away anything that has fallen and to regularly trim back the foliage. Once Mother Nature transitions to the White Season, Elee Deschu said it’s a waiting game for enough snow to accumulate. They want a base of 18 to 20 inches of snow. 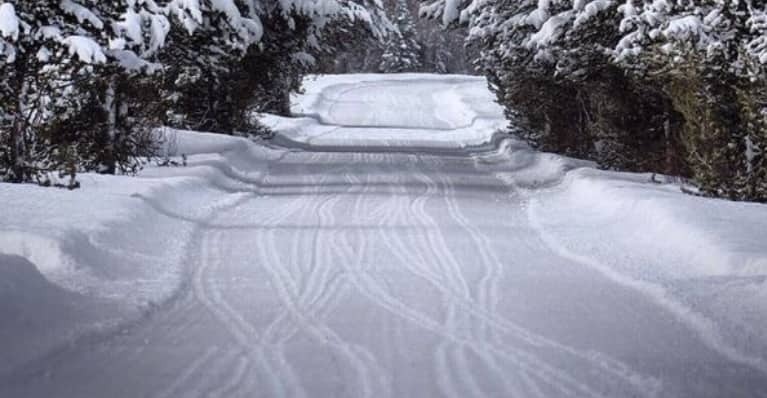 We could leave it alone and let skiers forge their own path. But that makes for a less than ideal experience. Skiing on a trail that isn’t groomed is especially tiring. It’s also a bit dangerous since cross country skis aren’t made for handling powdery snow. By Thanksgiving or early December, enough snow for a base has arrived. 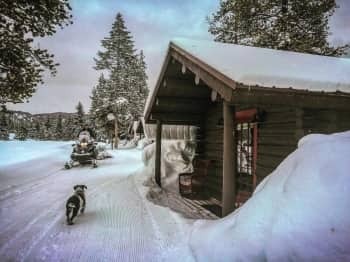 That kicks off a two-step process that begins by sing a PistenBully, which is the same type of snow groomer you see at Alpine ski resorts. The PistenBully is used to compact the snow, push out the air and create that base layer. It usually takes two or three runs to complete the process and is dependent on the consistency of the snow. Deschu said heavy and wet snow coming from the Pacific Northwest compacts easier compared to drier snow coming north from Utah. This is where we set ourselves apart from other trail systems in the area. With the base layer set, a Viking snowmobile becomes the primary machine to fine tune the trails. It drags a Ginzu Groomer, which is a combo tool. The teeth on the Ginzu till up the snow that is then smoothed over into the corduroy pattern by a mat. The timing of the daily grooming depends on the snow conditions and temperature. If the overnight temperature is going to really drop, the team grooms at night. If they wait until the morning, they risk the chance that the snow will be too cold and crystalized balls would form. Normal temperatures or a forecast of heavy overnight snow dictates the grooming will be done early in the morning. 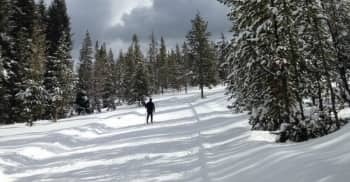 The daily groomed trail is a draw for guests at the ranch and day visitors who visit for the varied terrain and smooth conditions. Deschu said while skiers might not give much thought to the process, they appreciate the results.